Another retirement savings opportunity for military personnel during deployment is the Savings Deposit Program. Troops deployed to designated combat zone can contribute up to $10,000 to a Savings Deposit Program account that guarantees 10% return per year. Contributions can be made for 90 days after leaving the official combat zone. For more information on the Savings Deposit Program, visit the military’s Defense Finance and Accounting Service website. 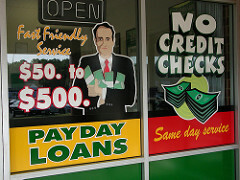 Payday lenders are found around military bases throughout the country. These lenders offer high-interest, short-term loans for emergency situations such as car repairs. If the loan is rolled over repeatedly, however, the effective APR can skyrocket – for a full year, the APR can be 300% to 500%. Instead of spending exorbitant amounts of money to pay for a loan, each branch of the armed forces has an Emergency Relief Fund with NO interest to assist troops with those same needs. These organizations offer interest-free loans to cover emergency situations including food, rent, utilities, medical expenses, car repair, emergency travel, and more. If a loan would cause undue financial hardship, it may be turned into a grant, which wouldn’t need to be repaid, or a combination loan and grant. For those who meet certain eligibility requirements, aid societies also provide educational scholarships for children and spouses, including surviving spouses, of military personnel.